C#.NET does not come with clear-cut for a dialog-box. That's because all Windows Forms can be dialog-boxes. There is no limit to the different types of .Net dialog-boxes that you can program in C#. 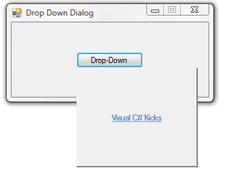 In this article we'll create an advanced dialog-box that will behave like a drop-down menu. The applications for it are equally limitless. For example, a custom color-picker, a user-drawn menu, an advanced selection control, etc. First you must establish the behavior of a C# drop-down control. To remove the titlebar from a Form while keeping the border, refer to the Titlebar-less Form article. It takes a couple lines of C# code. Which will tell the C# window to keep track of the mouse cursor even when it clicks on things outside your C# program. Finally, to hide a program from the taskbar set the ShowInTaskbar property and to make the dialog stay on top set TopMost to true.